I've recently got a fresh new licensed IntelliJ IDEA 12 and have been so glad about it until I've suddenly stumbled upon a strange issue. 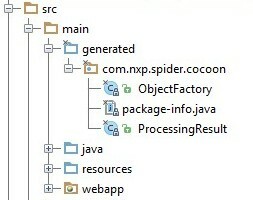 The Java project that was being developed successfully in previous versions of IDEA crashed during building this time. Shortly, the solution was hidden under IDEA Settings Compiler.Excludes where the JAXB generated sources directory was excluded due to some unknown reason. Below are the details and the screenshots. Here is the screenshot with the solution for this issue. You just need to delete the item with excluded sources and they will again magically appear in the classpath. Also I've created a ticket for IntelliJ IDEA developers as the odd behavior is obviously caused by some bug: IDEA-97975. Are you sure, that adding src/main/generated with build-helper-maven-plugin works in IntelliJ? It does not work in IntelliJ 12. It works fine for me, I'm using the latest version 12.1 atm. But it worked with older build of IntelliJ IDEA 12 as well. Did you try to remove IntelliJ IDEA project files (ipr, iml, iws, idea) and recreate the project using File -> Import Project? I mentioned this in the post as well. Before I did this trick, I also faced problems. Maven Projects -> Reimport should help as well.